Western blot analysis of extracts from mouse brain tissue and C2C12 cells using LRRK2 (D18E12) Rabbit mAb (Biotinylated). 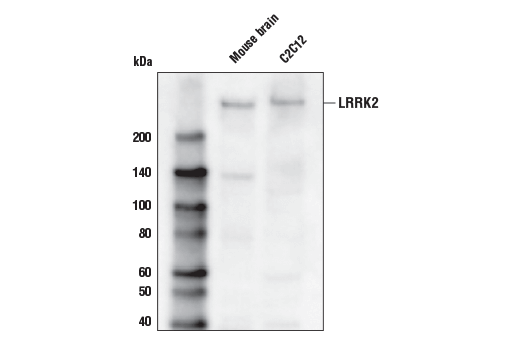 LRRK2 (D18E12) Rabbit mAb (Biotinylated) recognizes endogenous levels of total LRRK2 protein. Monoclonal antibody is produced by immunizing animals with a synthetic peptide corresponding to residues surrounding Pro2080 of human LRRK2 protein. Parkinson’s disease (PD), the second most common neurodegenerative disease after Alzheimer’s, is a progressive movement disorder characterized by rigidity, tremors, and postural instability. The pathological hallmarks of PD are progressive loss of dopaminergic neurons in the substantia nigra of the ventral midbrain and the presence of intracellular Lewy bodies (protein aggregates of α-synuclein, ubiquitin, and other components) in surviving neurons of the brain stem (1). Research studies have shown various genes and loci are genetically linked to PD including α-synuclein/PARK1 and 4, parkin/PARK2, UCH-L1/PARK5, PINK1/PARK6, DJ-1/PARK7, LRRK2/PARK8, synphilin-1, and NR4A2 (2). Leucine-rich repeat kinase 2 (LRRK2) contains amino-terminal leucine-rich repeats (LRR), a Ras-like small GTP binding protein-like (ROC) domain, an MLK protein kinase domain, and a carboxy-terminal WD40 repeat domain. Research studies have linked at least 20 LRRK2 mutations to PD, with the G2019S mutation being the most prevalent (3). The G2019S mutation causes increased LRRK2 kinase activity, which induces a progressive reduction in neurite length that leads to progressive neurite loss and decreased neuronal survival (4). Researchers are currently testing the MLK inhibitor CEP-1347 in PD clinical trials, indicating the potential value of LRRK2 as a therapeutic target for treatment of PD (5). Parkinson Study Group. (2004) Neurology 62, 330-332.